The number of Muslims in the Asia-Pacific region – which, for purposes of this report, includes not only East Asian countries such as China but also countries as far west as Turkey – is projected to increase from about 1 billion in 2010 to about 1.3 billion in 2030. Nearly three in- ten people living in the Asia-Pacific region in 2030 (27.3%) will be Muslim, up from about a quarter in 2010 (24.8%) and roughly a fifth in 1990 (21.6%). More than half of the world’s Muslims live in the Asia-Pacific region. However, the region’s share of the global Muslim population is projected to decline somewhat in the next 20 years, from 62.1% in 2010 to 59.2% in 2030. This is because the Muslim population in Asia-Pacific is not growing as fast as the Muslim population in some other regions, such as sub-Saharan Africa and the Middle East-North Africa. The number of Muslims in the Asia-Pacific region is expected to grow at a slower pace in the next two decades than it did in the previous two decades. 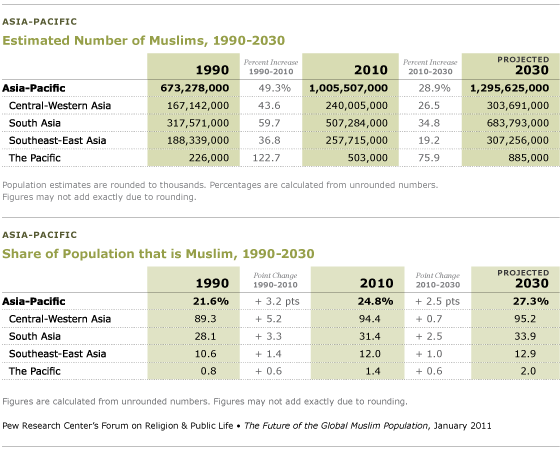 From 1990 to 2010, the number of Muslims in the region increased by 332.2 million. The number is projected to increase by 290.1 million in the next 20 years. 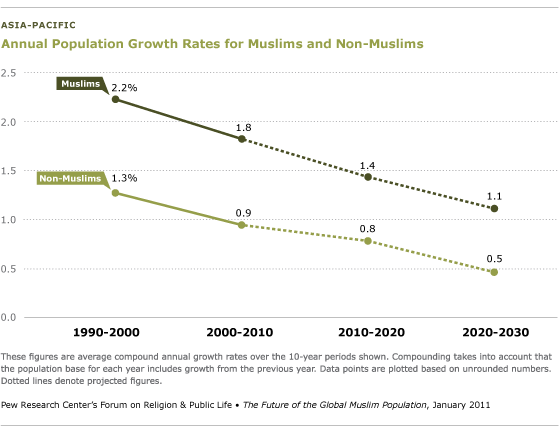 Although Muslim population growth in the region is slowing, it is expected to remain significantly higher than the annual rate of growth of the non-Muslim population in the region. 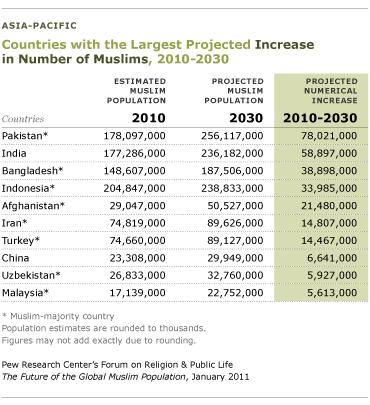 Thus, the Muslim population in the Asia-Pacific region is projected to rise both in absolute numbers and in relative terms, as a share of the region’s total population. The Muslim population in South Asia is projected to increase by 176.5 million, from 507.3 million in 2010 to 683.8 million in 2030. Muslims are expected to make up a third of the population of South Asia in 2030 (33.9%), up from 31.4% in 2010 and 28.1% in 1990. The Muslim population in Central-Western Asia is expected to grow by 63.7 million, from 240 million in 2010 to 303.7 million in 2030. While this sub-region has fewer Muslims than South Asia or Southeast-East Asia, Muslims make up a much larger share of the population. Indeed, more than nine-in-ten people living in Central-Western Asia are Muslim; this percentage is projected to increase slightly over the next 20 years, to 95.2% in 2030 compared with 94.4% in 2010. Relatively few Muslims live in Australia, New Zealand and other countries in the Pacific sub-region. But the combined number of Muslims in these 24 countries is expected to increase by about 76% in the next 20 years, from 503,000 to 885,000. Six of the 10 countries in the world that have the largest number of Muslims in 2010 are in the Asia-Pacific region: Indonesia, Pakistan, India, Bangladesh, Iran and Turkey. All six are expected to remain in the top 10 in 2030. The number of Muslims in China is expected to grow at a slower rate in the next 20 years than it did in the past two decades. 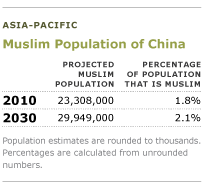 From 1990 to 2010, the number of Muslims in China increased by 6.5 million, a 38.4% increase. The country is expected to add a similar number of Muslims from 2010 to 2030, but because the base number in 2010 is larger than it was in 1990, the projected percentage increase is smaller (28.5%). 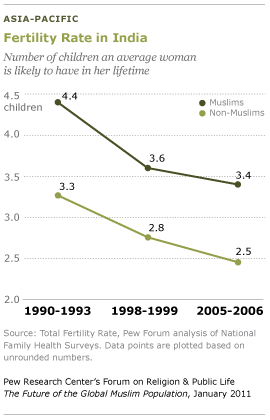 The fertility rate for Muslims in China is higher than the fertility rate for non-Muslims. Muslim women in China have an average of 1.7 children, compared with a national average of 1.4 children.2 This is one reason the Muslim share of China’s total population is expected to increase slightly in the next 20 years, from 1.8% in 2010 to 2.1% in 2030. Muslims in China are somewhat less urbanized and less educated than the general population. These characteristics are often associated with higher fertility rates. At the time of the 2000 census, 31.2% of Chinese Muslims lived in urban areas, compared with 36.9% of the country’s population as a whole. In the same year, Muslims in China attended school an average of 6.8 years, compared with a national average of 7.6 years. Muslims are not a new presence in China. Most of China’s Muslim communities, including the Hui, Uygurs and Kazakhs, have lived in China for more than 1,000 years. The largest concentrations of Muslims today are in the Western provinces of Xinjiang, Ningxia, Qinghai and Gansu. A substantial number of Muslims live in the cities of Beijing, Tianjin and Shanghai. By 2030, however, Pakistan is expected to surpass Indonesia as the country with the single largest Muslim population in the world.24 Pakistan’s Muslim population is projected to increase by 78.0 million, from 178.1 million in 2010 to 256.1 million in 2030. Indonesia’s Muslim population is forecast to grow by 34.0 million, from 204.8 million to 238.8 million. Like Pakistan, India and Bangladesh are also each projected to have larger increases in the number of Muslims than Indonesia from 2010 to 2030. Indonesia’s projected drop from the No. 1 spot is due in part to its declining fertility rate, which is expected to be 2.0 in 2010-15. In Pakistan, by contrast, the fertility rate among Muslim women remains relatively high (an estimated average of 3.6 children per woman in 2010-15), which is one factor driving the expected surge in its Muslim population. In Bangladesh, the Muslim population is expected to grow by nearly 39 million, from 148.6 million to 187.5 million. Bangladesh now has the fourth-largest Muslim population in the world and in the Asia-Pacific region; it is expected to remain in the fourth spot in 2030. Iran and Turkey are each expected to add roughly 15 million Muslims to their populations in the next 20 years. Iran’s Muslim population is forecast to grow from 74.8 million in 2010 to 89.6 million in 2030. Turkey’s Muslim population is expected to increase from 74.7 million to 89.1 million. Afghanistan has a much smaller Muslim population than either Iran or Turkey, but the number of Muslims in Afghanistan is expected to increase by almost 74% in the next 20 years, from 29 million in 2010 to 50.5 million in 2030. While most people living in Afghanistan are Muslim, Muslims live as minorities in some of the Asia-Pacific countries that are projected to have the greatest proportional increases in the size of their Muslim populations, including New Zealand, Australia and the Philippines. The Muslim population in New Zealand is expected to grow by nearly 150%, from about 41,000 in 2010 to about 101,000 in 2030. By contrast, the country’s non-Muslim population is expected to increase by about 14% during this period. India is projected to have the third-largest Muslim population (in absolute numbers) in the world by 2030, following Pakistan and Indonesia. 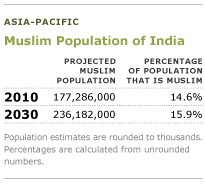 The Muslim population in India is projected to increase from 177.3 million in 2010 to 236.2 million in 2030. The Muslim share of India’s population is expected to increase from 14.6% in 2010 to 15.9% in 2030. More than one-in-ten of the world’s Muslims (10.8%) will live in India in 2030, about the same as in 2010. Fertility rates for all populations in India have been declining in recent years, in part because of increasing use of birth control. However, Muslims in India continue to have more children on average than non-Muslims, mainly because Muslims’ use of birth control still falls below the national average. In 2005-2006, for example, 45.7% of Muslim couples used some form of birth control, compared with 56.3% of couples in the general population, according to an analysis of the National Family Health Survey. Muslims in India are poorer and less educated than other religious groups. These characteristics are often associated with higher fertility rates. For instance, according to the 2001 census, only 3.6% of Muslims in India age 20 and older are college or university graduates, compared with 6.7% of all Indians in this age group. The literacy rate among Muslim women (50.1%) is lower than the rate among other women in India, including Hindus (53.2%) and Christians (76.2%). Muslim women also are less likely to work outside the home than non-Muslim women, and employment is associated with lower fertility. Muslims have lived in India since the advent of Islam. The country’s first mosque is said to have been established around 630 A.D., even before the death of the Prophet Muhammad. 2 The number of Muslims in India declined in 1947 when India gained its independence and an estimated 7 million people migrated from India to Pakistan, but India’s Muslim population has been rising steadily since. Muslims live throughout India. According to the 2001 census, a large concentration of Muslims lives in two of the largest and poorest states, Uttar Pradesh and Bihar; 35.6% of all the Muslims in India live in these two states. An additional 14.6% of the country’s Muslims live in West Bengal, which adjoins Bihar and borders Bangladesh. The remainder of the country’s Muslim population is scattered in more than 20 other states. Although Muslims constitute a small minority in most Indian states, they make up roughly a third of the population in Assam (30.9%) and about a quarter of the population in both West Bengal and Kerala. Muslims constitute a majority of the population in the northernmost state of Jammu and Kashmir, where they make up 67.0% of the population. In Australia, the Muslim population is forecast to grow by nearly 80%, from approximately 399,000 to 714,000, while the non-Muslim population is projected to increase by roughly 18%. The Muslim population of the Philippines is projected to increase by about 50%, from 4.7 million in 2010 to about 7.1 million in 2030, while the non-Muslim population is expected to grow by roughly 32%, from 88.9 million to 117.3 million. With few exceptions, there is not expected to be much change among the Asia-Pacific countries in the percentage of their populations that is Muslim. 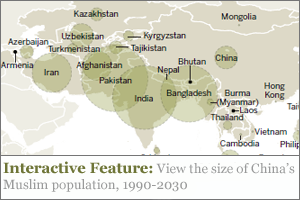 Kyrgyzstan, in Central- Western Asia, is projected to have the biggest increase. 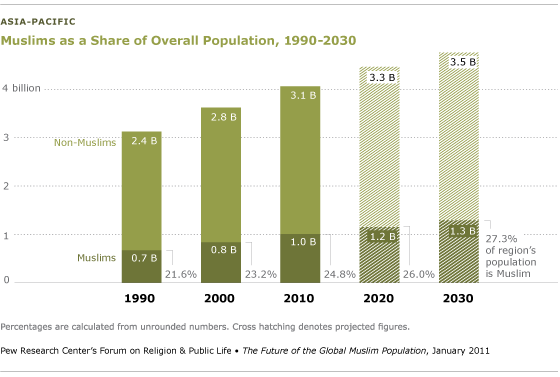 Nearly 94% of its population is expected to be Muslim in 2030, up from about 89% in 2010. As noted in the sidebar on page 76, the percentage of India’s population that is Muslim is expected to increase from 14.6% in 2010 to 15.9% in 2030. 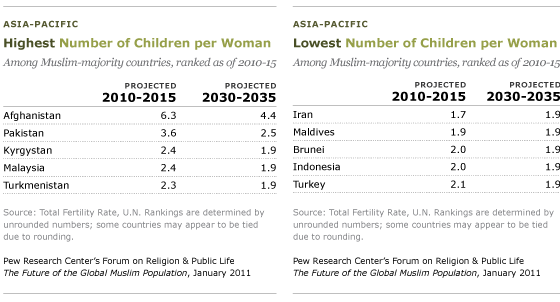 Fertility rates have fallen in most of the Muslim-majority countries in the Asia-Pacific region in recent decades. Yet they remain, on average, somewhat higher than in other less-developed countries in the region and considerably higher than in more-developed Asia-Pacific countries. This is one of the main reasons that the Muslim population is projected to rise both in absolute numbers and as a share of the region’s population. The Asia-Pacific countries classified as more-developed – including Japan, Australia and New Zealand – already have fertility rates significantly below the replacement level of 2.1 children per woman, the minimum necessary to keep the population stable (absent other factors, such as immigration).25 In the Asia-Pacific countries with Muslim majorities – including Indonesia, Iran, Turkey and Malaysia – the average Total Fertility Rate (the total number of children an average woman would have in her lifetime if fertility patterns did not change) has dropped substantially, as shown in the graph on page 79. By 2030, it is projected to reach 2.1 children per woman, which is at or below replacement levels in those countries. However, the rate for Muslim-majority countries in the region is still expected to be somewhat higher than the rate for other developing countries in the region (1.9 children per woman in 2030-35). Among the Muslim-majority countries in the Asia-Pacific region, the highest total fertility rate is in Afghanistan, where the average woman has more than six children during her lifetime. The lowest rate among Muslim-majority countries in the region is in Iran, where the Total Fertility Rate is 1.7 children per woman. 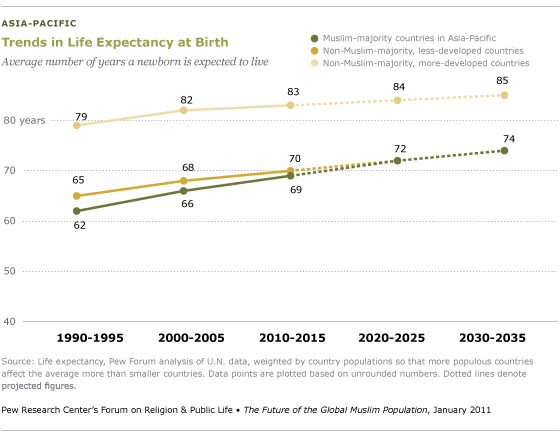 Life expectancy at birth for Muslims in the Asia-Pacific region has been steadily increasing.26 From 1990-95 to 2010-15, average life expectancy at birth in the Muslim-majority countries in the region is expected to rise from 62 to 69; by 2030-35, it is projected to be 74 – the same as for other less-developed countries in the region. However, average life expectancy at birth in the more-developed countries in the region is expected to be 85 – more than a decade longer than in Muslim-majority and other less-developed countries in the region. Brunei has the highest life expectancy at birth (78) among Muslim-majority countries in the region today, and Afghanistan has the lowest (45). 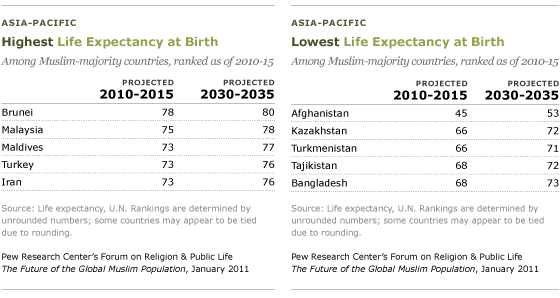 Life expectancy in Afghanistan is projected to rise to 53 by 2030-35. 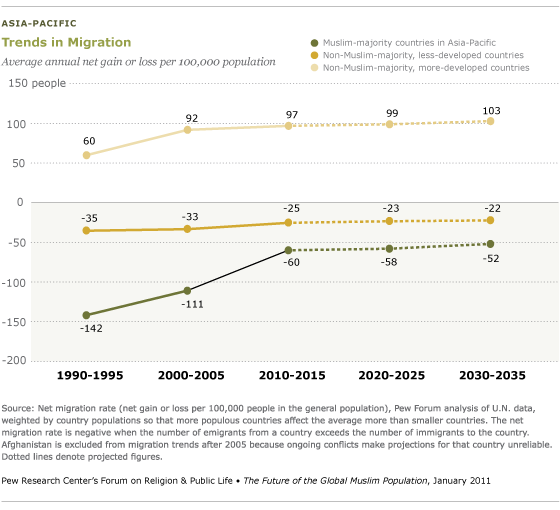 On average, more people are leaving Muslim-majority countries in the Asia-Pacific region than migrating to them. Although the rate of people leaving has declined significantly since 1990-95, Muslim-majority countries in the region are still losing part of their populations to emigration, a trend that is projected to continue over the next 20 years. By 2030-35, Muslim-majority countries in the region are expected to have average annual net losses of 52 people per 100,000 in the general population, down from net losses of 60 people per 100,000 annually in 2010-15. As recently as 1990-95, Muslim-majority countries in the region were losing 142 people per 100,000 annually. Of course, not all people who move from Muslim-majority countries are Muslims. Studies have shown that religious minorities sometimes migrate in larger proportions than religious majorities. (See migration section on page 38.) This is the case for several Muslim-majority countries in Central and Western Asia, including Kazakhstan, Kyrgyzstan, Uzbekistan and Azerbaijan. While some of the people leaving these countries are Muslims moving to other parts of the former Soviet Union, a significant number are ethnic Russians, Germans, Armenians and Jews. Of course, a country’s total gains or losses as a result of net migration rates depend on the total population of the country. In Pakistan, for example, a net loss of 100 people per 100,000 population would amount to a loss of roughly 185,000 people annually. In Azerbaijan, by contrast, this rate of loss would amount to fewer than 9,000 people annually. A few Muslim-majority countries in the Asia-Pacific region, including Turkey, are experiencing a net inflow of migrants. Previously, Turkey lost more people than it gained, but as the economic situation in the country has improved, population losses have been balanced by population gains, including Turks returning from abroad. Muslim-majority countries in the Asia-Pacific region have more-youthful populations than other countries in the region. As of 2010, people under age 30 make up about 58% of the population of the region’s 15 Muslim-majority countries. By contrast, less than 30% of people living in more-developed countries in the region are under 30. 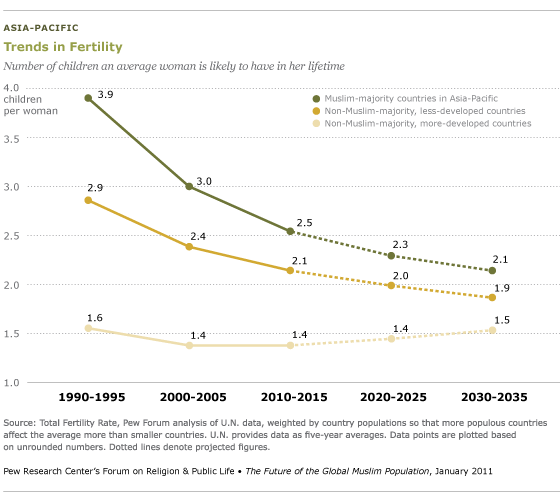 A larger percentage of the population in Muslim-majority countries in Asia-Pacific are now in or soon will enter their prime childbearing years (ages 15-29), which is yet another reason for the continued growth of the region’s Muslim population. People ages 15-29 make up 28.5% of the total population in the region’s Muslim-majority countries, compared with 25.7% in other less-developed countries and 16.0% in more-developed countries. At the same time, as fertility rates drop – meaning that fewer children are born per woman – and life expectancies rise, the Muslim population in the Asia-Pacific region is aging. This is reflected in the median age in Muslim-majority countries in the region, which has climbed from 20 to 25 in the past two decades and is expected to reach 32 years in 2030. 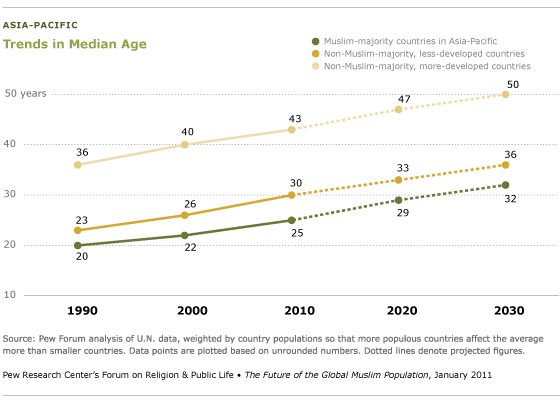 Although median ages are rising, Muslim-majority countries in Asia-Pacific are projected to remain relatively youthful in comparison with other countries in the region. By 2030, about 47% of the population in the region’s Muslim-majority countries is expected to be under age 30, compared with about 41% of the population in other less-developed countries in the region and about 24% of the population in the region’s more-developed countries. 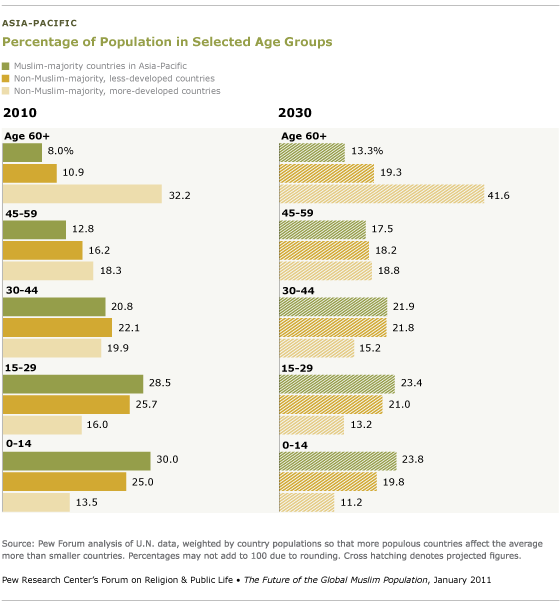 During the same period, the portion of the population in the 30-44 age group in the region’s Muslim-majority countries is projected to rise only slightly, from 20.8% in 2010 to 21.9% in 2030. The portion of the population that is ages 45-59 is expected to rise more substantially, from 12.8% today to 17.5% in 2030. The fastest growth of all will likely be among those age 60 and older, who are projected to rise from 8.0% to 13.3% of the population in Muslim-majority countries in Asia-Pacific. However, the percentage of the population 60 and older will remain significantly smaller in the region’s Muslim-majority countries than in more-developed countries, where 41.6% of the population is projected to be in this age bracket in 2030.